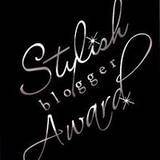 A great big thank you to Michelle at www.wanderingstill.blogspot.com for passing along the Stylish Blogger Award to me! It's my first! 1. I am living my dream come true. A stay-at-home mom with two smart, fantastic kids and a great husband to boot. 2. I can't stand to exercise. 3. I am dying to go to Tahiti and stay in one of those thatched huts over the water. 4. I've never had a pet and don't understand pet mentality. I wish I could overcome that and get my son a puppy. 6. I love to clean house, organize closets and rearrange cabinets and drawers. 7. I get seasick, airsick, and carsick. I hate that. Congratulations, your blogs are great! thanks! and I remind my husband almost daily that I want to stay in a hut over the water too!! I think maybe for our 10 year anniversary we will plan a big Tahiti or Fiji dive trip and do it! Thanks for including me in the list. And while I don't get sick traveling, I do hate it with a passion. Thanks so much! We have lots in common - I too hate exercise and am a grammar snob! Must admit I'm not such a fan of cleaning though! Thank you for the mention! I'm a grammar snob too and I would love to stay in a hut over the water! I used to get violently carsick as a kid although luckily not so much any more. Thanks Sonja for including me on your list. I am so with you on that pet thing. I keep telling my kids they can have as many pets as they like - when they move out of my house. Tahiti sounds wonderful. Please take me with you. I once had an opportunity to stay in one of those huts on my way home from New Zealand but passed it up. I've been kicking myself ever since!